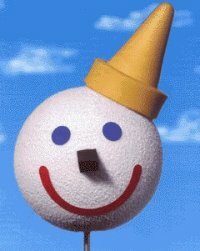 I had never been to a Jack-in-the-Box® until the summer of '97. My fiancee and I were vacationing in Las Vegas and stopped at Jack-in-the-Box® for lunch. Having lived most of my life in New England, this was a new experience for me. They were selling these funny looking antenna balls (see left) for 99 cents (?). Not wanting to leave Las Vegas without a souvenir we bought one; it's been on my antenna ever since. I didn't realize the 'Power of Jack' until several months later in November of '97. My fiancee and I were going to a mall to do some browsing and were looking for a parking space. Keep in mind that this is less than eight weeks until Christmas when the chances of finding a space close to the mall are slim. As I drove down one of the many vehicle-packed rows, I spotted a Jack-in-the-Box® antenna ball on one of the cars in the next lane. (Remember, this is New England, there are no Jack-in-the-Box® restaurants here.) I decided to drive down that lane (just out of curiosity) and can you believe it? the car next to the one with the Jack antenna ball started pulling out of its space. I pulled in and ended up only 10 cars away from the mall entrance. The powers of Jack must have been at work. Do you have a "Power of Jack" story you would like to share? Send me an email with all the details and I will post it on this page. As of Monday, 19-Jan-98 12:58:47 ESTthis page has been viewed times. Last update occured on January 13th, 1997.